I was tidying up the teen section at work and I happened to find this sticker poking out of one of the John Green books. Intrigued I checked the others but there was only a small handful with stickers in. Now I did a check online and as far as I could tell it’s not an official thing (which would also be suggested by the fact that none of the ones on the teen table had this sticker in). 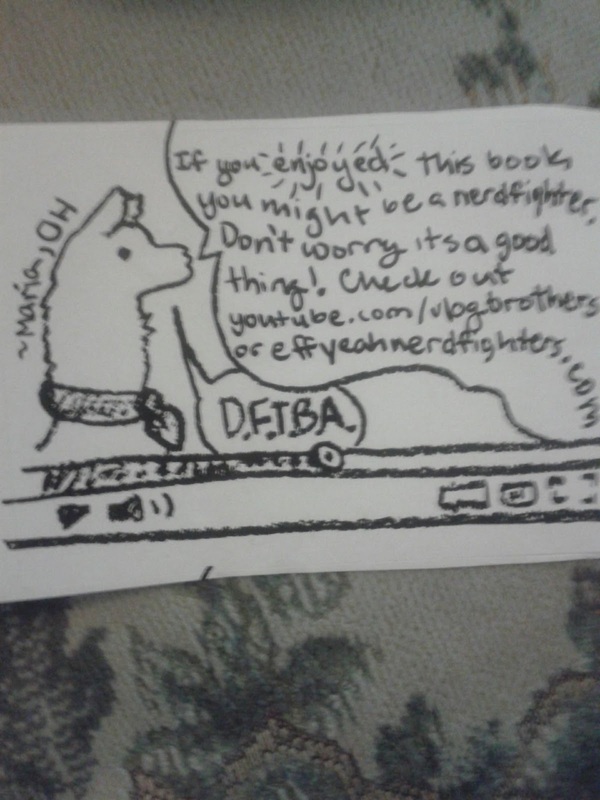 However, my searching did throw up a tumblr about nerdfighters leaving notes in John Green’s books. So I have two questions! My first question is this: did a UK nerdfighter leave this rather awesome sticker in the books? And my second question is this: which of John Green’s books do you recommend I read first?